With Valentine’s Day just around the corner, it is a great time to get creative. 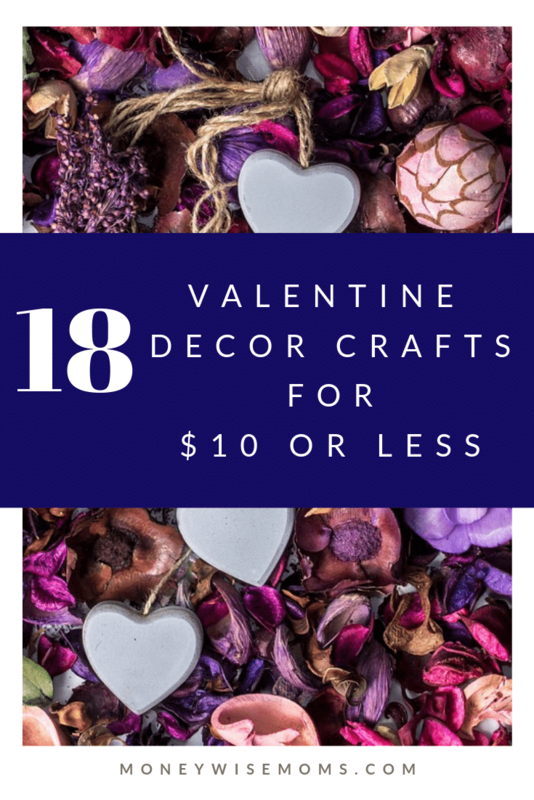 Get your supplies out and ready to make one or more of these Valentine Decor Crafts that are under $10 to make! 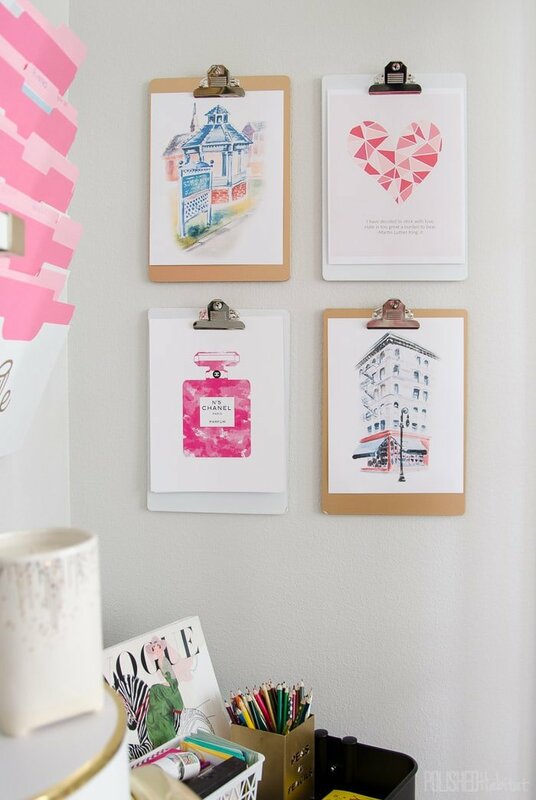 These simple ideas are great for your home, teacher gifts or to give your favorite Valentine. Get your pipe cleaners, paints, cardboard and all of your crafting supplies out to make some of these frugal Valentine’s Day crafts. Short on time? 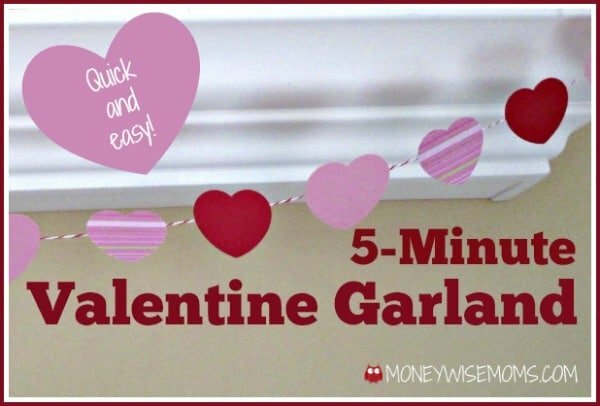 This 5-minute Valentine Garland is just paper and string, and so quick to make! A Keepsake Valentine’s Garland is the perfect activity to make each Valentine’s Day and watch how your child matures as they grow. Pallet Heart Garland is the perfect way to spend a rain or snow day to help keep the kids busy. And it’s made from cardboard! Need a wreath for the front door, entryway, or the family room? Look no further than the DIY Valentine’s Day Decor Wreath made for under $5. Love the Dollar Tree? Whip up this perfect Valentine’s Day Wreath with items from the Dollar Tree! 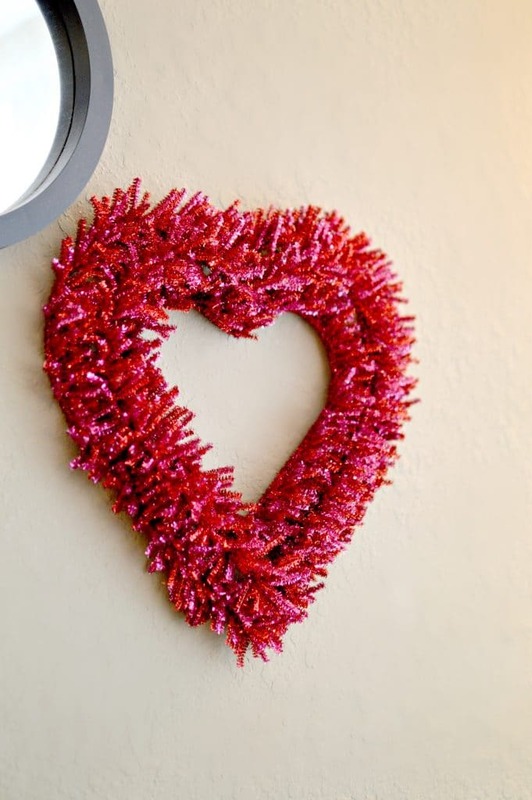 This Pipe Cleaner Heart shaped wreath is the perfect answer for Valentine’s Day. Now I have to decide which wreath to make first! Love flowers, but not the cost? These Valentine’s Day Pine Cone Roses are adorable and the kids can get some and you can both get some exercise while picking them up. Winning! 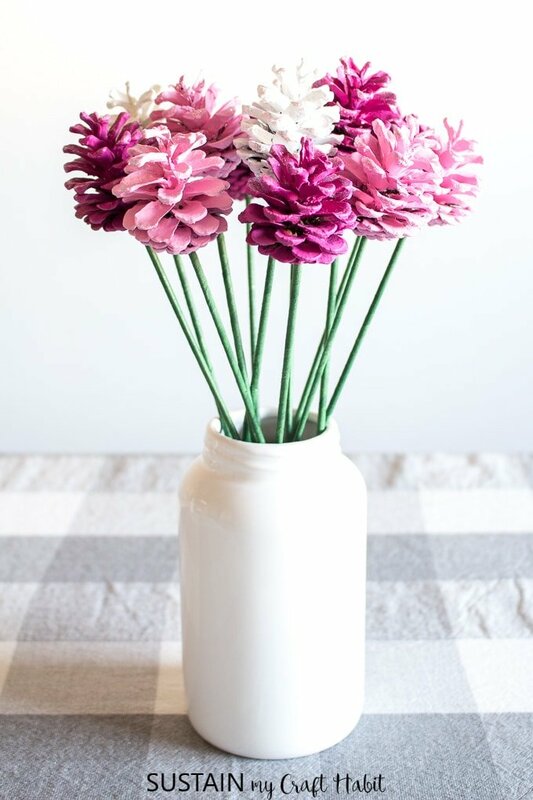 This darling Upcycled Vase Trio is the perfect way to recycle & decorate for Valentine’s Day. This Mason Jar Valentine’s Day Jar is perfect for flowers, candy, or even decorating the desk for Valentine’s Day. These Easy Felt Roses can be used year after year! Everything is better with candles! 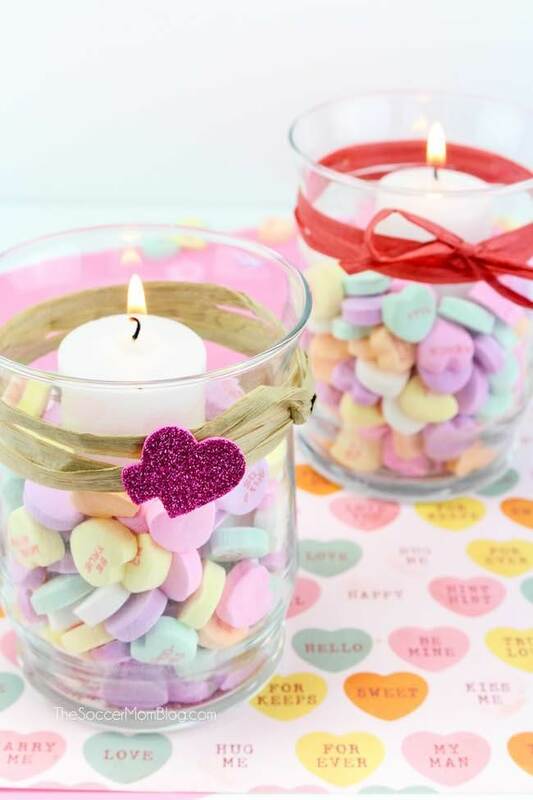 Take the conversation to the next level with this adorable Conversation Heart Votive craft idea. Whip up a DIY Cinnamon Stick Candle to help you celebrate a romantic night in. Plus the smell is out of this world! Free Valentine Printable and Peg Family is the perfect craft for Sunday school classes, or homeschoolers. Decorating on a budget? Then print out these Valentine’s Day printables and decorate the bathroom, bedroom or any room in between. Having a party? Then make this Easy DIY Piñata for Valentine’s Day. It will be a hit for sure–ha ha, get it, hit? Or if you want to multi-task, check out these Simple Valentine’s Day Ideas that will work for Winter Decor too! Show Me Your L*VE Painted Canvases would be the perfect gift for grandparents! Plus they would be fun to make as a family and see how many different looks you get out of the same supplies. Need a fun Valentine’s Day card? Don’t worry, these adorable Hot Air Balloon Valentines are the perfect solution.